Hello everyone, Catherine Scanlon back again for my last Guest Designer post for eclectic Paperie -- first I want to mention that Kim now has my stamps and stencil in the store, you can find them here. 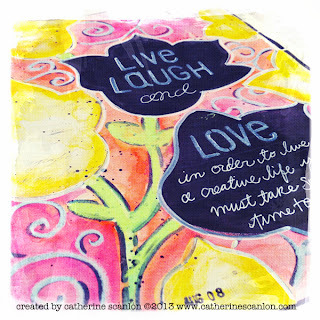 For the art journal page I'm sharing today I used the 9 x 12 Journal Flowers Stencil and the Clear Stencil Alphabet. 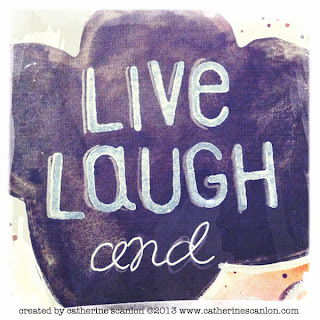 I really love this stencil and the fun things that can be created with it. 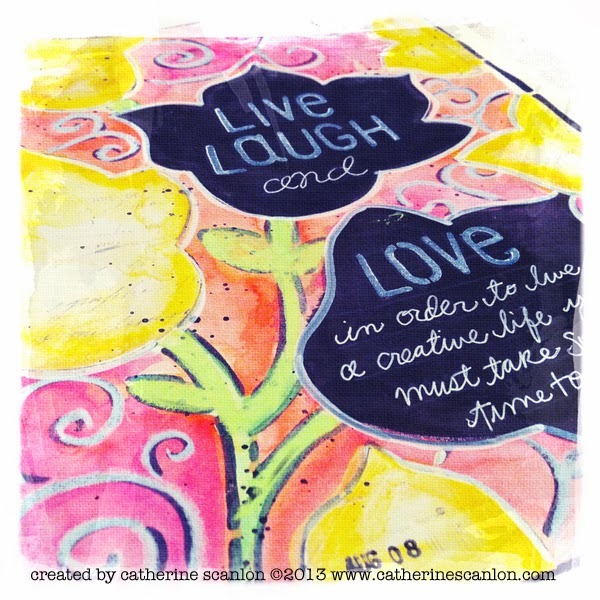 This particular stencil was inspired by a piece of art I created in one my classes over at My Creative Classroom and the stamps -- well they just make me happy! I've been using the plastic lettering templates for years to help me with my hand writing and having them as stamps is another way I can get amazing looks on my art journal pages, cards and any project I need a block alphabet for. To create this art journal page I used Liquitex Black Spray Paint with the stencil on mixed media paper. Then I used the stencil as a template to cut some scraps of patterned papers and glued them in place here and there -- but I left the two center flowers black so I could add some stamping and journaling with white ink and pen. 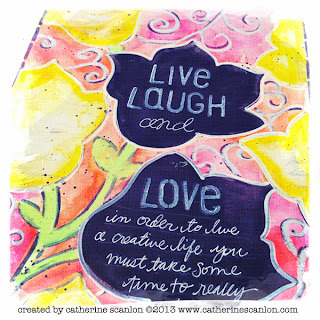 For color I used my watercolor palette, watercolor crayons and distress paint to get some beautiful colors. The white around the edge of the flowers is a White Faber Castell Marker. I sanded the black flowers ever so slightly to give the black spray paint a bit of a distressed look before I added the stamping and journaling. 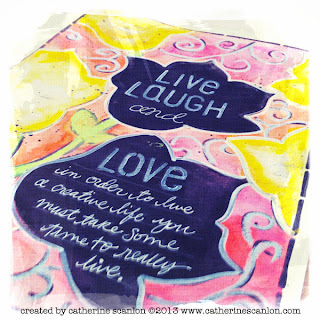 The journaling was written using a white Gelli Pen from Sakura. There you have it, a simple yet colorful and balanced art journal page to add to my stash of pages I've created with my stamps and stencils. I love the way this turned out. THANK you all for joining me this month for my guest design posts at eclectic paperie. I hope you'll come on over and visit me on my new website and blog. Have a great day! Gorgeous spread. Love how that Liquitex Spray Paint looks, almost looks like chalk paint! LOVE the colors and the vibrancy of them. Catherine your work is so vibrant and full of rich color...your simple is stunning! 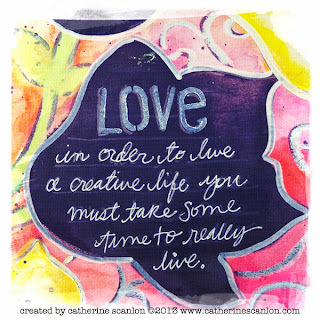 Wonderful art journal page! The black flowers have that chalkboard style and the colors contrast is fab.